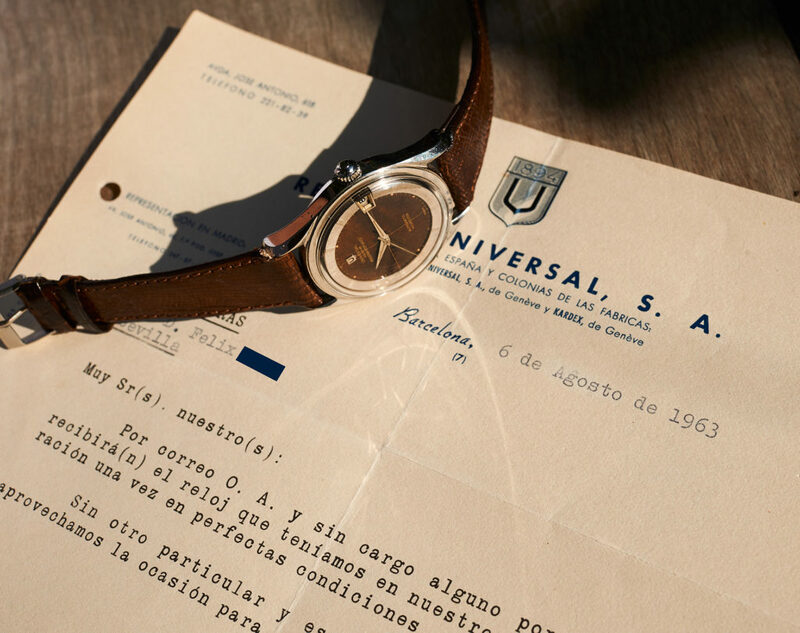 the polerouters of universal geneve recently get more and more attention by collectors, as they deliver every magic a vintagewatch can give you. 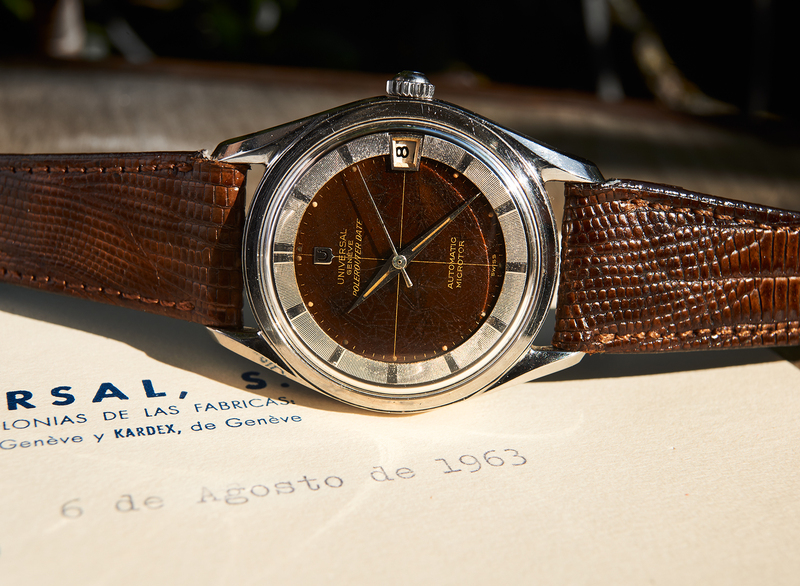 outstanding history as a toolwatch, great quality in movement, case and dial, and beautiful details designed by genius gerald genta who was also responsible for creating such gem´s as the patek philippe nautilus or the audemars piguet royal oak, amongst others. 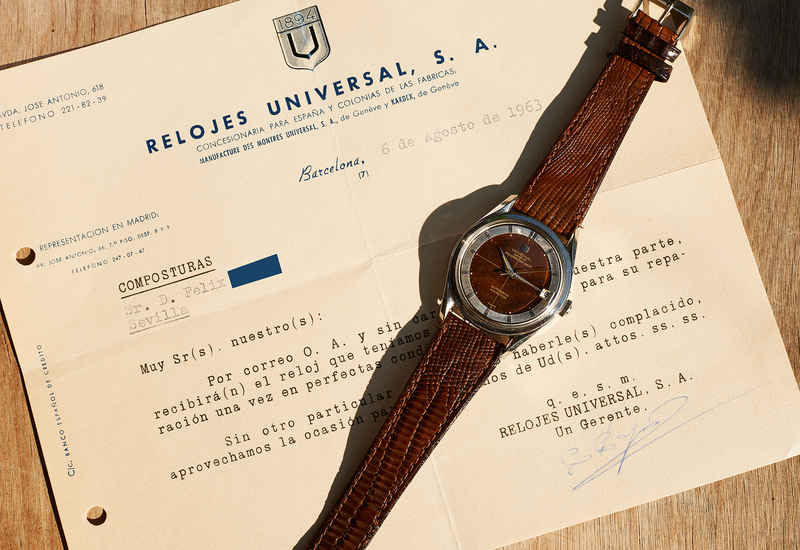 the watch, we are able to offer here, is something quite special as it even comes with an original service document from 1963, written by Universal Geneve in Barcelona. We have had and dealed many polerouters over the past 5 years but never the chance to see such a rare original servicepaper by UG itself. 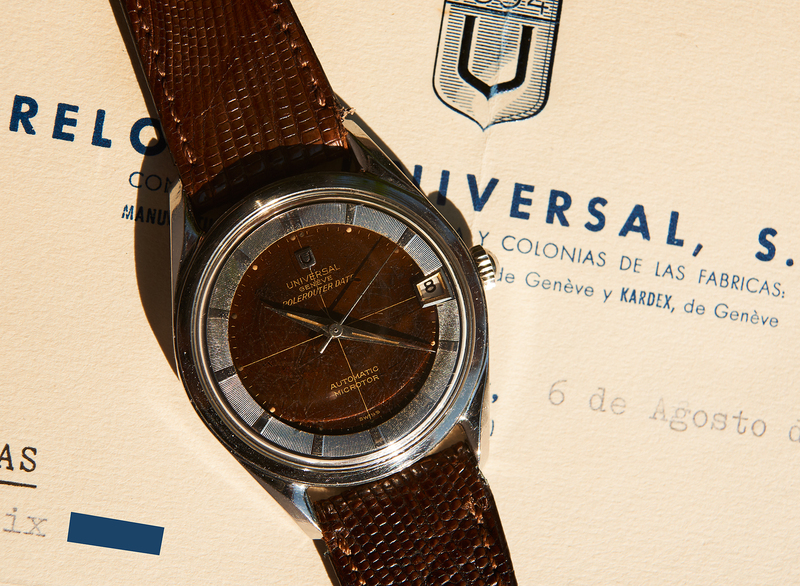 Apart from that the watch itself stands for it´s own, as the early U-shield dial (ref. 204503 from 1959-1960) has faded into an extremely appealing look with different shades of brown and „spider-effect“ structures. 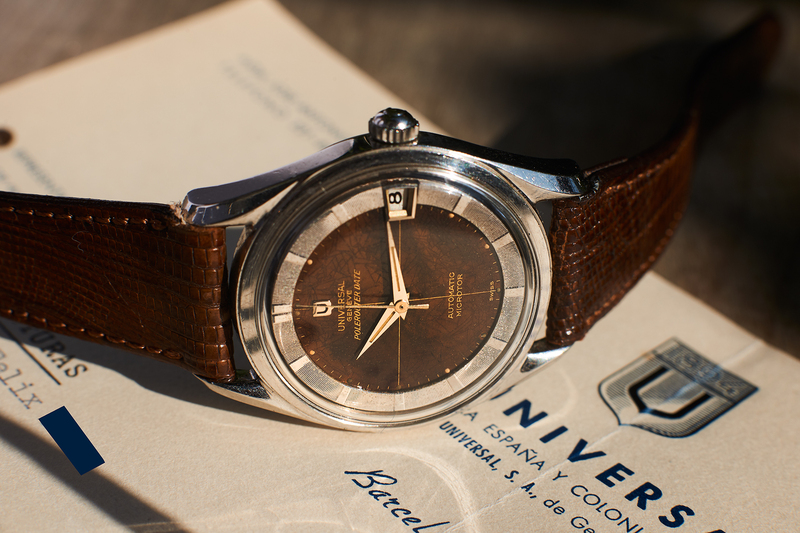 this dial may be the most awesome polerouterdial we have seen so far. An absolute piece of artwork created by almost ten decades of passing time. 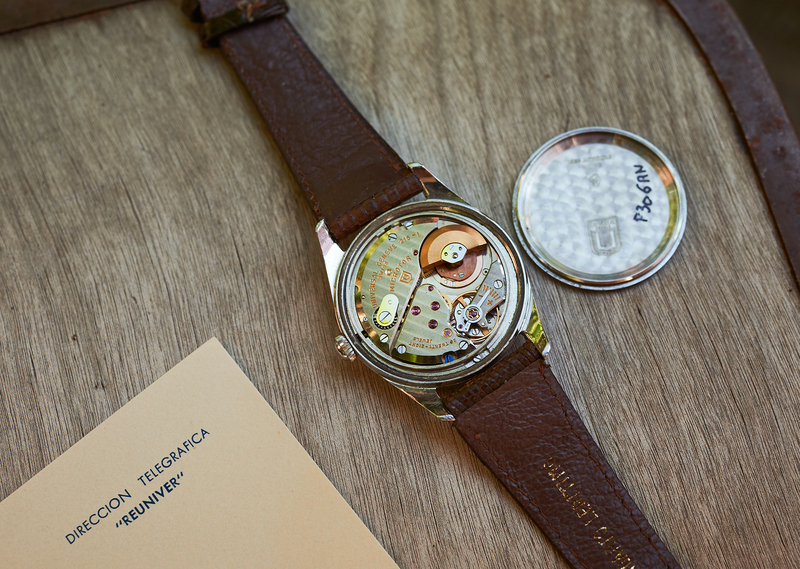 It´s good to know that also the HF case is still unpolished, the numbers (between lugs as rarely seen) are clearly readable and the 215-1 microtormovement is still in an excellent condition and working order. 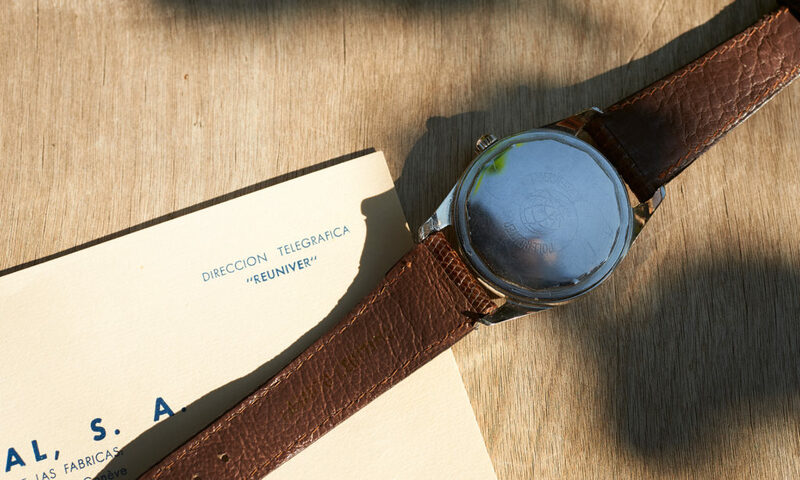 We aquired it on the brown leatherstrap you see on the images, which is 1 mm too wide for those lugs, only that it is fitting so incredibly perfect stylewise, that we have decided to leave it on the watch. In addition you will receive an exactly fitting new black leatherstrap from us, so you could change whenever you wanted. This piece is one for the true polerouter aficionado outthere.